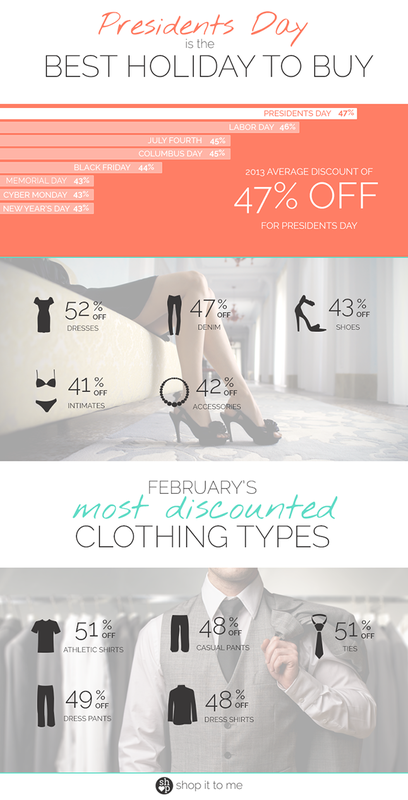 Presidents’ Day is the best holiday to buy compared to other U.S. holidays with an average discount of 47% off. If deep discounts are what you’re after, follow our sale roundup all weekend for codes and deals aplenty! Shoe Clearance! Markdowns on shoes for women, men and kids up to 40% off. No code needed. Ends Sun 3/2. Take an extra 25% off all sale items with code SALE25. Ends Mon 2/17. Take an extra 20% off sale and select full price items with code FEBRUARY20. Ends Mon 2/17. Take an extra 20% off outerwear and cold weather accessories, plus free shipping on all U.S. orders. No code needed. Ends Tue 2/18. Take up to an extra 50% off for a total savings up to 75% off sitewide. No code needed. Ends Tue 2/18. Take an extra 35% off everything, plus 60% off cold weather items. No code needed. Ends Thu 2/13. Take 20-65% off a great selection of merchandise. No code needed. Ends Mon 2/17. Take 25% off select styles with code HEART214. Ends Fri 2/14. Take 30% off full-price styles and 60% off sale styles with code SHOPANN. Exclusions apply, see site for details. Ends Tue 2/18. Take 40% off select full-price styles and 60% off sale styles with code SHOP40. Ends Fri 2/14. Take $50 off your purchase of $150 or more with code HEART50. Ends Mon 2/17. Take 40% off all full-priced items and 30% off all sale items with code INLOVE. Ends Fri 2/14. Take an extra 50% off already-reduced prices. No code needed. Ends Mon 2/17. Take an extra 25% off sale items. No code needed. Ends Fri 2/17. Take 40% off your purchase. See site for details. Ends Fri 2/17. Check back for more additions throughout the weekend! Weekly Sale Guide: Valentine's Day Sales up to 80% off!